EJIMEL is listed in the Directory of Open Access Journals (DOAJ) and registered with the NSD-Database. El-Wereny, Mahmud (2018). Fatwas und Muftis im Zeitalter des Internets: Das Fatwa-Portal islamfatwa.de als Fallstudie. Electronic Journal of Islamic and Middle Eastern Law (EJIMEL), 6:57-77. Büchler, Andrea ; Schneider Kayasseh, Eveline (2018). 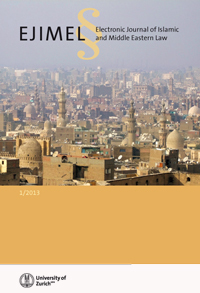 Fostering and Adoption in Islamic Law - Under Consideration of the Laws of Morocco, Egypt, and the United Arab Emirates. Electronic Journal of Islamic and Middle Eastern Law (EJIMEL), 6:31-56. Alaoudh, Abdullah (2018). Imagined Religious Institutions: Pre-modern Hanbali Ulama in the Juristic Sphere from (850-1350). Electronic Journal of Islamic and Middle Eastern Law (EJIMEL), 6:1-29.